Saturday morning and following a chain of events I found myself in the kitchen crying - as you sometimes do when you're a 39 year old highly strung and emotional female. The children were upstairs, but they still managed to hear me. My girl came down, tiptoed up behind me, wrapped her arms around me and squeezed me tight. "Mummy, to stop crying you should smell the strawberries and blow out the candle." My muddled brain processed the words and then that is exactly what I did. 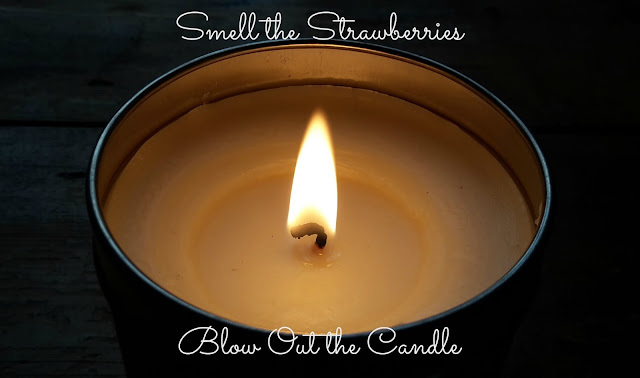 I smelled the strawberries...deep breath in. I blew out the candle...exhale. Wise words from a nine year old. I cried a little more at this strange role reversal that was occurring with my girl comforting me with a hug and wonderful words of advice. Then I followed her words again. Smell the strawberries and blow out the candle. "Adults get upset sometimes, we get cross with each other, we cry and that's just fine." Well, at least I hope it is. I have never been ashamed to cry in front of the children whether it be watching an emotional film, tears of laughter, seeing them singing in their Christingle services. It is a human emotion. Children cry. Adults cry. We cry in sadness and we cry in happiness. I want my children to feel comfortable to express their emotions. Growing up as the youngest of five with older, for those times anyway, parents I never saw emotions openly displayed so I feel I am bucking the family trend. Unlike when I was a child and teenager keeping my emotions locked away to myself, I want my children to be able to tell me when they're feeling down. I want them to know I will always be here for them. I want to raise them in a happy, loving home but for them to realise it isn't always peachy and perfect. Adults disagree; we argue, we fall out, we get upset. Maybe sometimes a little too often. Some might argue they shouldn't see the upsets but only the good times. Maybe we should shelter them from grown up emotions. Maybe disagreements should be done with muffled words away from their little ears. Maybe the adult tears should be wiped away from their view. But I know I am doing a good job. I know we are doing a good job.